NJ Paleo Girl: Paleo Beauty Friday: Natural Face Masks! Paleo Beauty Friday: Natural Face Masks! To me there is nothing better than spending a few relaxing minutes indulging in homemade beauty remedies. Sitting on the couch, gook on your face, good movie on TV —Ahhhhh, perfect lazy day! So today I’m bringing you a plethora of face masks; one for each of your aliments. Whether your skins feeling a little dull, dry or oily, I have the mask for you. All masks use easy to find, cheap ingredients that you probably already have in your cupboards. So if you have a couple minutes--- give yourself a present: tighter skin, smaller pores, or softer skin! 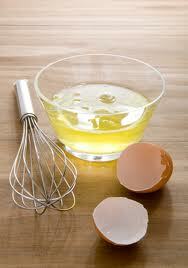 An egg white face mask is a wonderful way to tighten your pores and give your face a temporary lift. 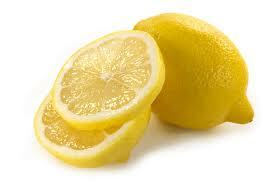 (It can be a little smelly) It is an easy, inexpensive way to help you feel as though you've been treated at a spa. Crack one egg and separate the yolk from the white. After 15 minutes rinse the face mask off with warm water. Most mornings I suffer the dreaded Puffy Eye! However, this little Paleo trick will make that a thing of the past! The oil from the avocado will moisturize the delicate skin under your eyes, while the cold compress will help reduce the swelling. Nice, simple, and you’ll love the results! Slice a peeled avocado half into quarter-inch crescent-shapes. Close your eyes and rest for 15- 20 minutes. Wash off by pressing the cloth to your face. 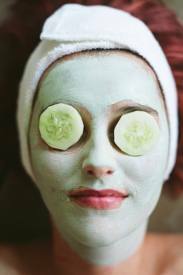 If your skin is red and blotchy, then cucumber is your answer! 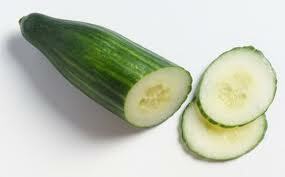 Cucumbers help in soothing and softening your skin (due to their incredible hydrating capabilities). They also have cooling effects, as well as a cleansing property that help to make your skin soft and supple. To combat redness this mask is just the ticket! Combine 1/2 cup chopped cucumber, 1/2 cup chopped avocado, 1 egg white, and 2 teaspoons powdered milk in a blender and process until a smooth paste like consistency is obtained. Apply, in circular upward motions, about 2 tbsp of the mixture on your face and neck. Pat dry with a clean soft towel. 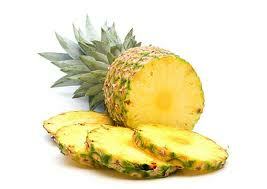 This exfoliating pineapple facial mask is perfect for all skin types. Pineapple contains a natural enzyme that works as an astringent (anti inflammatory, refining, and toning) and exfoliator, helping to cleanse the outer layer of the skin. The olive oil helps to moisturize and soothe the skin. Rinse well and pat dry. Dry skin is more prone to wrinkles than any other, so it needs to be treated well. For this problem, a strawberry and clay mask is the best choice you can make. 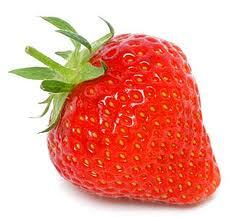 Strawberries’ juice and seeds gently exfoliate the skin while honey and clay purifies it. Place the mask on your face and leave it there for 15- 20 minutes. Enjoy! What are your favorite paleo beauty mask recipes? Natural products are not harmful to the skin. Very Nice though on skin care. This can make everyone healthy and fitness to achieve their healthy life. Hey, Nice healthy support on natural face masks to support skin health. Thanks for sharing such type healthy information. Thank you for the post. It's so great that information like this is out here so once again thank you. I wanted to post to share about another website called skin tightening that also has some do t yourself skin tightening treatments. Thanks again for the post. Keep up the good work! Paleo Friendly St Patrick's Day! A quick and easy weeknight meal! 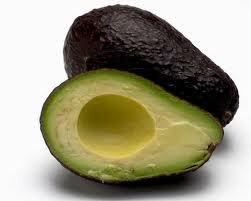 Paleo Food of the Week: Avocado! Thirsty--- What's a Paleo Girl to Drink? lent means no meat! what’s a paleo girl to do? the BEST Pork Chops you'll ever have! i cheated on valentine’s day!